Scott Morrison delivered his first and perhaps final budget as Australian Treasurer in the last days of the Abbott/Turnbull Government. The 2016-17 Budget was presented by the Treasurer, Scott Morrison in the House of Representatives on Tuesday, 3 May 2016. The 44th Parliament was dissolved a few days later on Monday, 9 May 2016 at the request of PM Malcolm Turnbull. 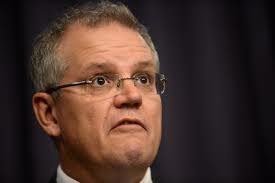 Scott Morrison consistently says the Government doesn't have a revenue problem. 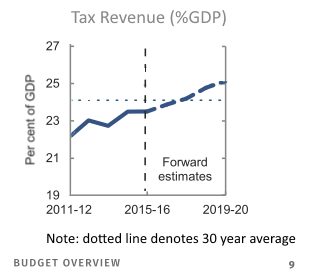 The budget summary in his budget does in fact show revenue as a share of the economy being higher than the long-run average next financial year. The same summary however shows tax revenue as a share of the economy being higher than the long-run average not just next financial year but in every following financial year. The share actually increases in every financial year to 2019-20, remaining well above the long-run average.